The Mexican Erk Aicrag (lyrics & vocals) and Racso Agroyam (programming) two angry survivors of the physical and mental violence rising daily on the streets of Mexico City, founded the electro band “Hocico”in 1993.
and interests from their childhood. With a Yamaha keyboard Racso began at the age of 15 to experiment. The correct pronunciation of the name is: “Osziko”. That means mouth or jaws. 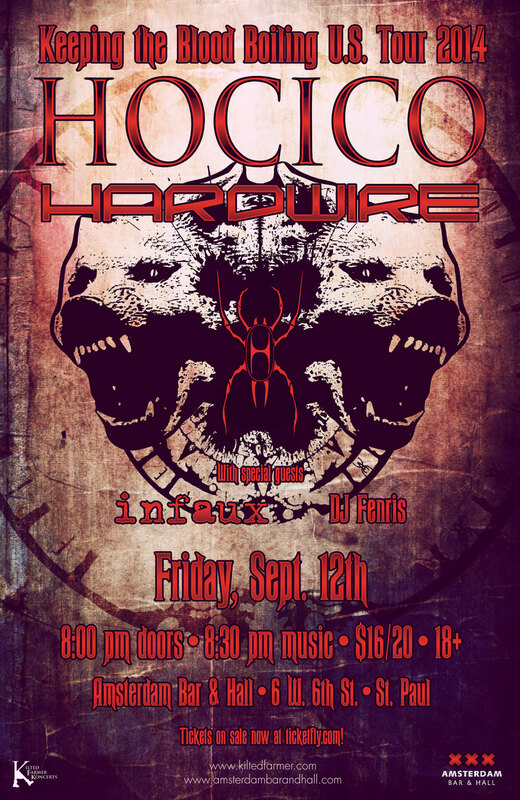 “Hocico” is a pretty aggressive word. In Mexico it has an offending affect, it’s a swearword, like a kind of attack. Hardwire originally formed in 1999 by: Michael Marsh and Ryan Hutman. The band has created and refined a unique sound of their own with musical influences by: Rammstein, Die Krupps, Nitzer Ebb, Ministry, Hanzel ünd Gretyl, KMFDM and Fear Factory. Revised in 2006, Jonah Foree of Ikonoklast joins on Guitar and Xiån Austin (formerly of Alter Der Ruine) joins on Drums and Synths making the lineup as it is today. Hardwire scored the music for the motion pictures “The Great American Snuff Film” in 2006 and “Death of a Ghost Hunter” in 2008. The band signed to Glow:Room Records in 2008 and released the EP/Remix album “KONFLICT” that featured new material + remixes by: Die Krupps, Angelspit, X-Fusion, En Esch of Slick Idiot, Collapsed System, Kreign, Caustic and C/A/T. In 2011 Hardwire signs to German label Danse Macabre Records and will release the new album titled: “Insurrection” in Europe and the U.S.
Stien was previously in de Nethermen. Robot was previously in Robots Rising. This entry was posted in Past Shows and tagged aggrotech, amsterdam, concert, dark electro, ebm, hardwire, harsh ebm, hocico, industrial, infaux, mexican aggrotech, mexico, minneapolis, minnesota, saint paul, st. paul, twin cities. Bookmark the permalink.